HI-TECH Pharmaceuticals Garcinia Cambognia is a multidirectional body mass reducer of natural origin, based on high standard extracts from Garcinia cambognia, rich in hydroxycitric acid (HCA). Gacinia cambognia is a popularly functioning Latin name of Garcinia gummi-gutta, a plant also called malabar tamarind, a tree belonging to the Clusiaceae family, coming from Indonesia, naturally overgrowing broad terrains of Africa. The most desired part of a given plant is a fruit resembling a small, green or yellowish pumpkin, picked mainly for oil extracted from its pips or skin, which in the form of powdered dried fruit is used as a seasoning enriching taste and smell of numerous dishes from local cuisine with a sour-spicy touch. In traditional Ayurvedic medicine it found application primarily to improve the condition of the digestive system and as an antirheumatic agent. For a long time, it has also been attributed other vital properties supporting body mass control. The unique features of Gacinia cambognia fruit are primarily looked for in the richness of many phytochemical substances, among others xanthones, benzophenones, amino acids (mainly gamma-Aminobutyric acid, shortened GABA) and organic acids, including citric, tartaric, malic, succinic acids, but primarily hydroxycitric acid. Hydroxycitric acid, also called 1,2-dihydroxypropane-1,2,3-tricarboxylic acid, in short HCA, a compound from the group of organic acids, occurring in nature in free form or in the form of less active, but stable lactone. Among its most essential sources, there are outer fruit parts of plants of Garcinia L. kind, mainly G. cambogia, G. indica, or G. atroviridis. It is also produced synthetically from citric acid as a starting substance. For commercial use, several derivatives of hydroxycitric acid were introduced, among others in the forms of sodium or calcium-potassium salts, which slightly change the priorities of the active compound action. Delivered from outside to the human organism it is able to interfere with carbohydrates-fats metabolism, influence mental well-being, lower the volume of inflammations and counteract bugs. The most essential mechanism by which it influences the human system is inhibiting the activity of ATP citrate lyase. • as a competitive inhibitor of ATP citrate lyase, an enzyme catalyzing citrate breakdown to oxaloacetate and acetyl-coenzyme A, lowering the amount of acetyl-coenzyme A by which it limits the availability of 2-carbon molecules required in order to synthesize fatty acid and cholesterol, inhibiting by the same token the process of lipogenesis and connected creation of new fatty compounds. • by limiting the utilization of carbon source in fatty compound synthesis and using it to glycogen synthesis, which changes the impulse quality regarding the information about hunger and satiation, increasing the serotonin level by blocking serotonin reuptake and diminishing malonyl-CoA level and connected negative carnitine acyltransferase (CPT-1) response functioning as a mediator of appetite, it reduces the level of hunger, thanks to which it lowers the amount of food intake, and at the same time the calories from food. 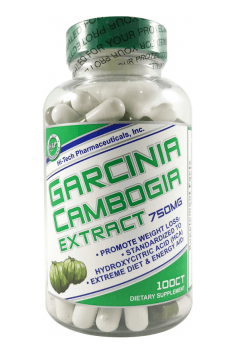 Apart from the properties facilitating the loss of excess body mass and subsequent weight control, Garcinia cambognia extracts demonstrate a range of other effects improving the state of the system. They are attributed among others antioxidant, anti-inflammatory, antifungal, antibacterial and limiting carcinogenesis effects. As the agents effectively lowering the level of triglycerides and cholesterol it also influences maintaining a good state of the cardiovascular system. HI-TECH Pharmaceuticals Garcinia Cambognia – is a preparation of natural origin facilitating losing weight, whose multilevel effect joining multitude mechanisms accelerating losing spare fatty tissue and improving the effectiveness of maintaining the appropriate weight, allows to achieve full satisfaction from the results during and after the reduction process. Supplementary anti-inflammatory and antioxidant properties and facilitation of certain systems functions introduce additional effects improving health condition of the organism. Two capsules 2 times a day before meals. The above indicated dosage well suited to support a reduction. For the best results can be combined with a thermogenic. The company Hi-Tech Pharmaceuticals was founded 1994 and it has grown to be a leader in the industry. It creates, manufactures and sells high-quality herbal products sold by the large, major retailers across the United States. The company has 45 supplements that develop muscle and strength, fat loss, sexual performance and healthcare. All products are aimed at improving life-quality and our supplements have unmatched in quality and efficacy. All their products are designed to improve the quality of life, and supplements are second to none in terms of quality and effectiveness. Hi-tech is a response to the needs of women and men, from active lifestyle to good sports condition. Hi-Tech Pharmaceuticals produces better products than the competition. Try it and you will not be disappointed. BCAA amino acids enhanced with B-vitamins. They improve muscle anabolism and help to maintain muscle mass.